Now I've had a chance to read the Digital Preservation Network (DPN): Final Report I feel the need to add to my initial reactions in Digital Preservation Network Is No More, which were based on Roger Schonfeld's Why Is the Digital Preservation Network Disbanding?. Below the fold, my second thoughts. The LOCKSS Program was 14 years old, had been in production use 8 years, and had been economically self-sustaining for 5 years. There had been three designs and two complete implementations of the protocol by which LOCKSS boxes communicated, the last of which was based on award-winning computer science research. "it has been more challenging for Portico to build a sustainable model than parts of the report suggest." Libraries proved unwilling to pay enough to cover its costs. It was folded into a single organization with JSTOR, in whose $50M+ annual cash flow Portico's losses could be buried. Thus e-journal preservation systems had a lot of experience showing that the real problem was economic, not technical, and that ingest was the largest cost. The LOCKSS team’s rule of thumb was that it was half the lifetime cost, with preservation being a third and access a sixth. And ingesting e-journals was cheap and easy compared to the less well-organized content the DPN hoped to target. E-journal preservation economics were based on protecting institutions’ investment in expensive subscription content. Elsewhere, things were less sustainable. Institutional repositories contained little, and what they did was not very important. The reason was that getting stuff into them was too hard and costly. Replicating pre-ingested content from other institutions was a quicker and easier way to increase the utilization of their repository than educating faculty. Jointly marketing a preservation service that, through diversity, would be more credible than those they could offer individually was a way of transferring money from other libraries' budgets to their repositories' budgets. Alas, this meant that the founders' incentives were not aligned with their customers'. Of course, the diversity goal also meant that the DPN was an add-on to their existing institutional repositories. A hypothetical converged system would have been a threat to them. cost problems, because this required site- and content-type-specific development, not development shared between the nodes. In December of 2014, Dave Pcolar was hired as the Chief Technical Officer and with his leadership and direction, a consensus was reached on the best approach to develop the network. The consensus was that the nodes would export a custom REST API. Because diversity was the whole point of the DPN, each node had to implement both the server and client sides of the API to integrate with their existing repository infrastructure. Pretty much the only shared implementation effort was the API specification. Which, of course, is what the diversity goal was intended to achieve. institutions repeatedly stated that they did not have a good workflow for digital preservation. Many institutions said that they did not have sufficient in-depth knowledge of their digital collections to manage them for long-term preservation. Local systems for managing content did not have a built-in “export to DPN” function and this presented a problem of how to prepare and move the content for deposit into DPN. But that wasn't the real management failure. It was true that diversity improved the network's robustness against hypothetical future attacks and failures. The fundamental management failure was not to appreciate that, in return for this marginal future benefit, diversity immediately guaranteed that the product they had to offer would be more expensive and take longer to build, be more expensive to operate and maintain, and be more complex and thus less reliable than a centralized commercial competitor. Several of which duly arrived in the market before DPN did. more than 500 participating institutions, predominantly US colleges and universities. bepress claims a US market share of approximately 50% overall, recognizing that not all institutions have an institutional repository. Among those universities that conduct the greatest amount of research, for example the 115 US universities with highest research activity, bepress lists 34 as Digital Commons participants, for a market share of about 30%. The diversity thing isn't going to be viable. What the world needs is a major improvement in the cost and ease-of-use of institutional repository ingest. Why don't we spend the money on that instead? The management had no concrete plan for solving the cost and ease-of-use problem, which was widely known to be very difficult, so success was unlikely. If success were achieved, it would benefit all institutional repositories, including the potential commercial competitors. Benefiting the repositories of the institutions behind the DPN was its real goal. Going in to the early discussions I didn't understand what the real goal was. At this point I need to confess that the focus on mitigating monoculture risk may have been my fault. If I recall correctly, I was the one who raised the issue. I hoped that the need for inter-operation among the institutions would motivate a second, independent implementation of the LOCKSS protocol. That would have both provided a well-proven basis for interoperability among the DPN nodes, and allowed LOCKSS to mitigate monoculture risk by using it for some of the LOCKSS boxes. I didn't understand that the various institutional repositories saw LOCKSS not as a useful technology but as a competing system. To them, whatever solution emerged from the meetings it was important that LOCKSS not be part of it. Once I figured that out, there was no point in participating in further meetings. All told, DPN spent just over $7M. Table 1 shows where the money went. Note that Overhead and Marketing consumed almost 60% of the total spend. Table 2 shows where the R&D spending went, illustrating the distributed and site-specific nature of the development mandated by the diversity goal. In my view, the key lesson to be learnt from the DPN Final Report is in this graph, from page 15. 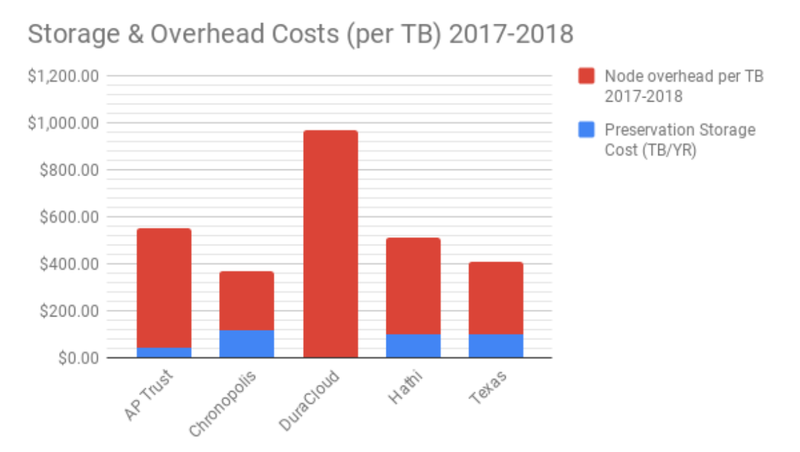 It shows that the vast majority of the per-TB cost of the system in operation was in overhead, not in actually preserving content. To be viable, the system would have had to preserve enormous amounts of data, while holding overhead costs constant. Of course, preserving vast amounts of data without increasing overhead would have needed much more efficient ingest mechanisms. Minimizing the cost of participating in the LOCKSS system is essential to its success, so individual peers are built from low-cost, unreliable technology. A generic PC with three 180GB disks currently costs under $1000 and would preserve about 210 years of the largest journal we have found (the Journal of Biological Chemistry) for a worst-case hardware cost of less than $5 per journal/year. Peers require little administration, relying on cooperation with other caches to detect and repair failures. There is no need for off-line backups on removable media. Creating these backups, and using them when readers request access to data, would involve excessive staff costs and latencies beyond a reader’s attention span. The peer-to-peer architecture of the LOCKSS system is unusual among digital preservation systems for a specific reason. The goal of the system was to preserve published information, which one has to assume is covered by copyright. One hour of a good copyright lawyer will buy, at  prices, about 12TB of disk, so the design is oriented to making efficient use of lawyers, not making efficient use of disk. An interesting and constructive suggestion for future efforts is at the end of this Quartz piece. Very good overview of some of the reasons why the DPN was not successful. I think a very pertinent sentence from your post is "Benefiting the repositories of the institutions behind the DPN was its real goal." I don't have any reason to think that was intentional but that does seem like the way it was managed from afar. The failure of DPN was not a technical problem but a management problem in that they, as this post describes, did not address (or apparently even seriously attempt to address) the needs of the customers in a way that was better or cheaper than other solutions.